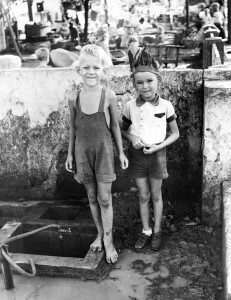 The invasion of the Dutch East Indies was an act of desperation by Japan to secure access to raw materials after the Allied embargo was imposed in June 1941. 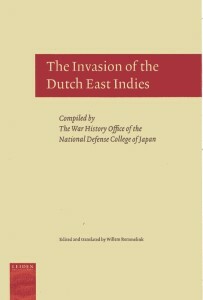 Willem Remmelink’s translation (673 pages) of the official Japanese war history, provides an extremely detailed account of the feverish attempt to extract Japan from its self-inflicted difficulties within an extremely small window of opportunity and with a serious shortage of resources for the monumental task undertaken. 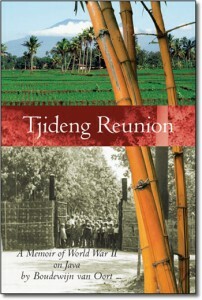 The book, Tjideng Reunion, provides the highlights of the campaign to capture Java (Chapter 4). For the diplomatic and military maneuvering prior to this time Bussemaker’s PhD thesis provides valuable information, summarised in Chapter 1,2 and 3 of Tjideng Reunion. Since Java , after 8 March1942 virtually ceased to be a scene of war, and therefore barely deserves mention in war histories, such as that of Liddell Hart. The subsequent military events that shaped our lives as internees (chapter 5 through 9) had to be pieced together from two other invaluable sources. Jan Bouwer’ s book Het Vermoorde Land, provides a view from the Indonesian perspective, whereas Leo Jansen’s diary, In Deze Halve Geschiedenis, the perspective from within the Japanese Propaganda bureau is given. The capture of the administrative centre of the Netherlands East Indies was for General Imamura the key objective. So critical was this objective that within three weeks of the attack on Pearl Harbor, the army was ordered to revise its plans and bring forward the conquest of Java by thirty days. At the time of the Pearl Harbor attack, the target date for capture of the Netherlands East Indies (NEI) had been set at 7 April 1942. The NEI capitulated at the Kalidjati military airfield strip north of Bandung on March 8, 1942. How this was achieved is outlined in the book “The Invasion of the Dutch East Indies“, Willem Remmelink, editor) published by the Leiden University Press (2015), and the source of this illustration. The map here illustrated taken from that document was unavailable when Tjideng Reunion was first published. 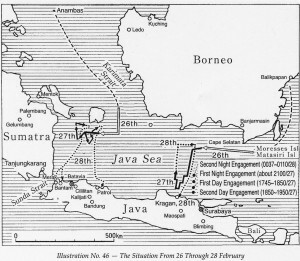 The Battle of the Java Sea, Feb 1942, referred to in the above map, was at the time the biggest naval engagement since the battle of Jutland. 2 Responses to "Invasion of the Dutch East indies"